If you heard Padang, the first thing in our mind is Padang's food, or the Padang house, with the apse, acute angled roof like buffalo horn called gonjong-gonjong. And of course the famous legend, Malin Kundang, the story of Siti Nurbaya, and "Teluk Bayur" a song singing by Ernie Johan in 1960's. 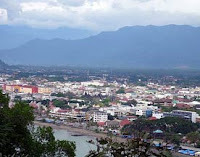 Geographically, this city is very interesting, lay between Mentawai strait and Seribu mountain range. With the result that, we can enjoy the harmony between the opulence culture and the natural capital or in urang awak, called rancak bana and make you always takana jo koto Padang (putting in mind to Padang city). At the beginning, Padang city was a residence for fisherman at the lower course such as Batang Arau, Batang Kuranji, Batang Muaro Panjalin, and Batang Anai. Since Pagaruyuang dynasty in 1667, VOC permissible to monopolized the commerce and built fortress at the side of Batang Arau. This city starts to develop around the VOC fortress VOC (then destroyed by England in 1781) and pribumi market (Pasar Gadang). Now, area around the fortress became the downtown of the old city (koto tuo) which full of colonial building. There is also Chinatown called Kampung China which full of building with china architecture. The buildings were traditional shopes and kelenteng (china temple), one of the famous kelenteng is Sin Hin Kiong. You can see the scenery of Koto tuo (old city) from the top of the Siti Nurbaya bridges at Batang Arau. This bridge became the landmark or tetenger Padang city. Previously, there was rail train alongside the north of the river. After revitalization project, the rail train area change into park and open area. There is maritime tourist quay at Batang Arau. Lots of foreign tourist rent boat to go to Sekuai Island Resort, about 25 to 40 minutes from the quay. The island was 40 hectares, surrounded by white sand, very exotic and charming. Other specific characteristic of Padang city is gonjong-gonjong roof. We can find this roof at almost all of the building, especially officeblock. The first officeblock that used this roof is the West-Sumatra government office building. 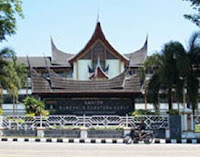 This building was Netherland debris, but in 1959 government of West-Sumatra, Kaharroedin Dt Rangkayo Basa told to change the colonial roof became the Minangkabau roof. In 1970's Azwar Anas(government of West-Sumatra command all buildings built with the same roof. 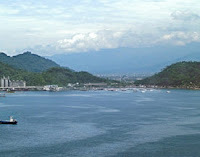 Other place which you should come is Bayur bay. You can find many people fishing at the south of this bay. You can also enjoy the scenery of the sunset. Although this area still in the city region, the ambience was still concerned with nature. It because the road at the side across the coast line was bordered with sea and jungle. You can hear wild animals from the jungle. If you stop by at the side of the bay and order some fried corn or fried banana, you should alert for the monkeys. The monkeys love those corns. They hoped that you give them some bananas. As compensation, those monkeys will give you a small attraction like small acrobat. They were crawl on hands and knees through the telephone cable and the electric pole. Other enchantment you can get from the bay is color of the water. It's light blue and the bottom of the sea is so clear, full of fish between the coral and sea plant. Far away from here you can see commercial sheep anchored. May be this enchantment inspired Ernie Johan to sing "Teluk bayur" song which very famous several decade ago.